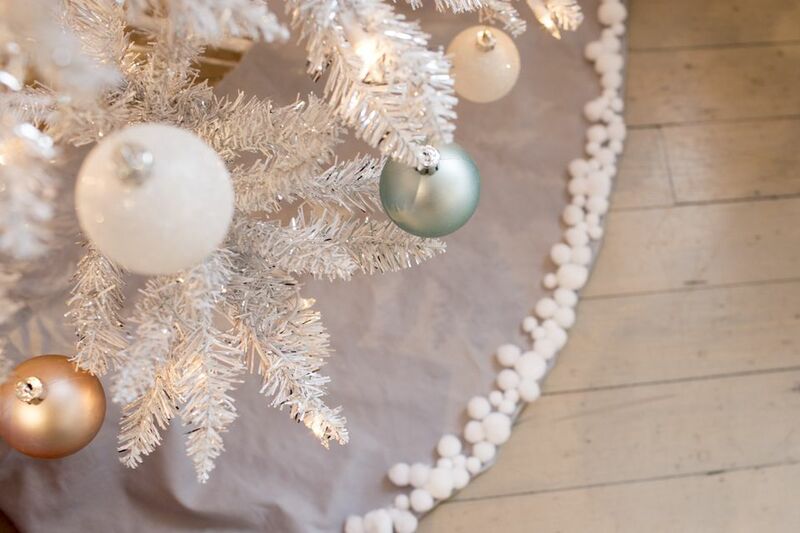 Tree skirts are a holiday staple that are often forgotten about, but really they're one of those essentials that finishes your tree off nicely. Oh, and it helps to hide that massive tree stand! While there's plenty of complicated versions out there that involve hemming and sewing on buttons, this version is simple and doesn't require a single stitch. Plus, it's simple and affordable enough to make, that you won't mind putting it on the ground. While a lot of people opt for felt or fleece, we recommend avoiding those two materials. Remember, this is going to be going on the floor and will attract dirt, dust, and any pet hair you've got on your floors. As for the size of the fabric, it really will depend on your tree. If you get a small one each year, you won't need much fabric. We'd suggest that you should buy at least two yards of fabric, though, and then you can cut it down to size if you need to. While a lot of tree skirts are circular, they don't have to be. You can choose keep it in a square shape and then just arrange it around the bottom of your tree as you'd like. First, fold your fabric in half and then use chalk to trace out a circular shape on our fabric. So, if you'd like a circular tree skirt, you'll need to draw a half circle on the fabric. The great part about using chalk is that it comes off nice and easy if you mess up! Once you're satisfied with the circular shape, you'll want to fold your fabric in half again and then cut out a middle circle, which is where the base of the tree will fit. Where you want the back of the skirt to be (the part that's hidden behind the tree), cut a slit from the outside of the circle to the inside circle. This will make it easier to wrap it around the tree. "Hem" is sort of a loose term in this case because you're not actually hemming the fabric edges. Instead, use a fabric adhesive that you can apply to the tree skirt, which allows you to fold the fabric over to create a hem. If you want to use Heat 'n' Bond, you'll need an iron to activate the adhesive. The beauty is you don't have to sew to create your hem! Work your way around the outside edge of the tree skirt, then do the edge of the slit, and the inside circle. Take your time and work slowly. The hem might not be perfect, but that's okay; you're going to be covering it with a decorative trim anyway. You can use pom pom fringe or just regular pom poms—or even felted pom poms! —depending on what look you're going for. Here, we used hot glue to affix different sized white pom poms to the bottom edge of the tree skirt. Just work slowly and add your pom poms where they look best. When you're satisfied with the look of your pom pom trim, you're all set!